In a country obsessed with eating, we’ve witnessed many food obsessions come and go, but the salted egg craze has been pretty persistent, managing to stay on trend as others fall off. Not that we’re complaining. Rich, gooey salted egg is one of those rare culinary delights that can be creatively incorporated into almost any dish, be it a main dish, dessert or snack. 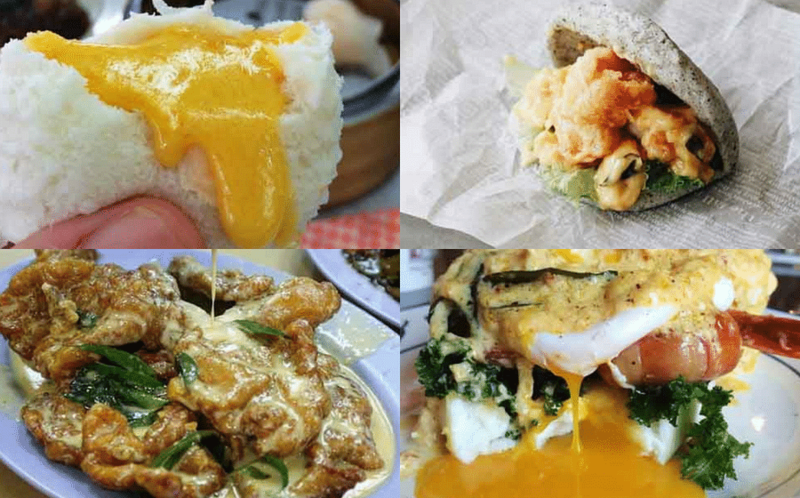 We’ve rounded up the best salted egg foods in Singapore to chow down on. Looking for a new weekend brunch spot? Try Drury Lane. Instead of using the usual Hollandaise sauce on their Eggs Benny, this dish ($17) is spiced up with a to-die-for salted egg yolk sauce that would send any salted egg yolk lover scrambling for seconds. Where: Drury Lane at 94 Tanjong Pagar Road. Tel: 6222 6698. One of the first few places to fuel the salted egg craze in Singapore, Flavour Flings’ Salted Egg Croissant ($6.90) is a must-try if you’re down for a buttery, decadent plate. The filling here is on the sweeter and milkier side, while the croissant itself is crispy and buttery. Give in to temptation and add a layer of raclette cheese (it’ll cost an additional $3) on top of the croissant. Froth serves up a unique risotto with a trio of eggs. The Three Egg Risotto ($25.90) is cooked with a mixture of both salted and century egg to create a creamy risotto base, before crumbles of century egg and a salty-sweet salted egg meringue are added. It’s all topped with an onsen egg. It’s over-the-top, eggy goodness, and you won’t mind one bit. Where: Froth Café at Ascott Raffles Place Singapore, 2 Finlayson Green. Tel: 6336 1228. Okay we know, we know… Dim sum restaurants selling Liu Sha Baos are a dime a dozen in Singapore. But those at Yi Dian Xin Hong Kong Dim Sum are the runniest and some of the most flavourful. It’s also one of the more pocket-friendly dim sum places to dine at, with its Liu Sha Bao going for $3.80 for three pieces. Where: Yi Dian Xin Hong Kong Dim Sum at 1012A Upper Serangoon Road. 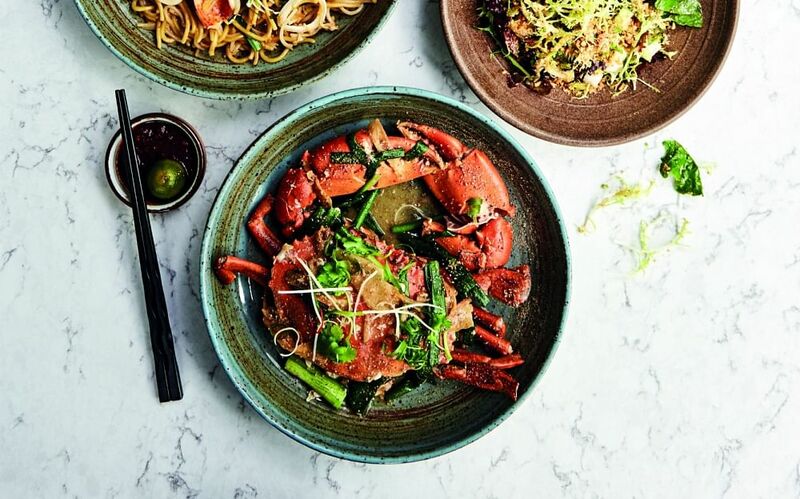 House of Seafood, located at the far end of Punggol Point, whips up local seafood favourites such as crabs and prawn rolls, and its Salted Egg Crab dish has been garnering a lot of attention and nods of approval. Served with a generous portion of salted egg sauce, you’ll be impressed by the crunchy bits of the yolk when you dig in. It’s a pricey option, around $65 for 1kg, but do note that crab prices are seasonal. 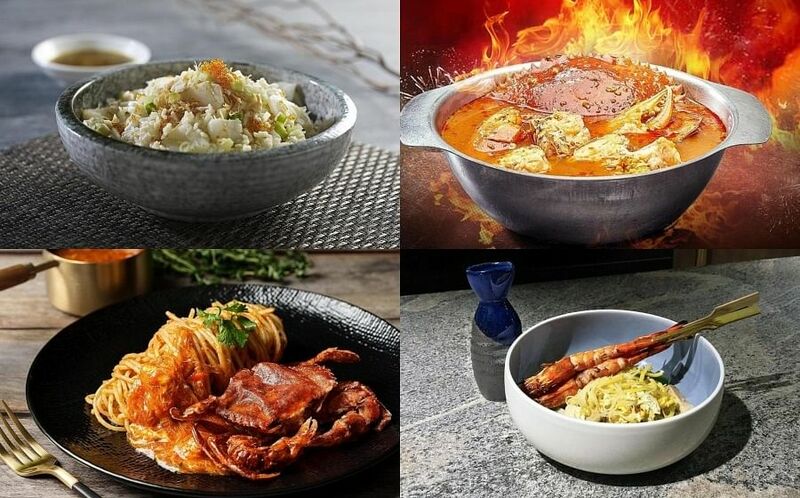 Where: House of Seafood at #01-01 & #01-02 The Punggol Settlement, 3 Punggol Point Road. Tel: 6466 9000. The traditional braised pork belly bao and the mantou-wrapped chilli crab baos are always faves here, but Bao Makers’ Salted Egg Shrimp Bao ($5.80) will blow your mind. The combination of juicy, plump stir-fried prawns smothered in salted egg yolk sauce, sandwiched in a fluffy handmade bao, is terribly hard to resist. You’ll find New Station Snack Bar on the fifth floor of Far East Plaza. The humble eatery serves up affordable Chinese food, and people in the know never miss out on ordering the Salted Egg Pork Ribs, priced at an unbeatable $6. The ribs are done to crisp perfection, and you’ll be surprised by how rich and creamy the salted egg yolk sauce is as well. Where: New Station Snack Bar at #05-95 Far East Plaza, 14 Scotts Road. Tel: 6734 2862. Snack it to me! The Golden Duck has two different types of salted egg goodness: Gourmet Salted Egg Yolk Potato Crisps and Gourmet Salted Egg Yolk Fish Skin (each at $7 per packet). Don’t hem and haw over which one to get – just buy both. They’re equally crispy, savoury and really addictive. We can’t have a round-up of salted egg goodies without mentioning IRVINS Salted Egg, the store which drew crowds at every outlet. Freshly made without preservatives, their chips ($8 for 105g, $16 for 230g per packet) are crispy and evenly coated with savoury-sweet salted egg yolk powder, then spiced with curry leaves and bits of red chili. As the warning on the packaging suggests, they can be dangerously addictive, so once you pop open a packet, you won’t stop. Not your run-of-the-mill ice cream. Tom’s Palette has been offering up its Salted Egg Yolk ice cream way before the craze began in Singapore (circa early 2016). Tom’s creations are all made in-house with less cream and sugar. For a richer taste and a smoother texture, less air is even beaten into the batches. The Salted Egg Yolk ice cream ($3.60) is just the right mix of savoury and sweet, and is akin to eating spoonfuls of smooth, creamy salted egg yolk custard. Where: Tom’s Palette at #01-25 Shaw Leisure Gallery, 100 Beach Road. tel: 6296 5239. Drop by Fat Cat Ice Cream Bar for their Charcoal Waffles ($6 without ice cream) and add on just $1 to drizzle your waffles with their popular salted egg yolk sauce. The crispy and fluffy waffles are complemented perfectly by the savoury salted egg yolk. Feeling courageous? Butterbeer is one recommended ice cream flavour to go along with this dessert. A traditionalist? Sure, you can have vanilla or hey, hazelnut. It’ll work well because you’ll really get to taste the syrup. Where: Fat Cat Ice Cream Bar at #01-25 416 Bedok North Avenue 2. Tel: 6241 0830. We’ve seen salted egg yolk oozing out of croissants and lava cakes. Tell us that it’s possible that it can explode out of a cookie and we’re SO in! At Creamy Boutique Ice Creams, an ice-cream flavour of your choice sits atop a charcoal cookie. The weight of the ice cream causes the cookie to split, and warm salted egg yolk sauce runs out into the bowl. The dish costs $9.90. Camera ready? No? Never mind, your spoon is more important. Where: Creamery Boutique Ice Creams at #01-03 139 Tyrwhitt Road. Tel: 8133 1250.